MEMPHIS, TN — For Madeline Lyles and Dana Taylor, being a mortician isn’t merely a profession, it’s an art form. Co-owners of After Life Mortuary Services in Memphis, Lyles and Taylor met while working as forensic technicians at the medical examiner’s office in Shelby County. After moving on to different jobs, they reconnected while working at Joe Ford Funeral Home. Though both discovered their passion for the mortuary business as teens, the idea for After Life came to Lyles when she was 19 and began plotting the vision of one day opening her own funeral home. After overcoming a series of obstacles that delayed her goal of opening a mortuary in 2015, she contacted Taylor in 2016 about co-owning the business. 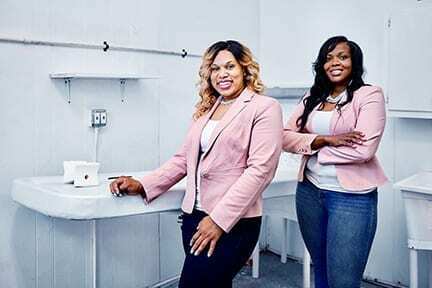 After Life officially opened its doors in 2018, making them the first African-American women to own and operate a mortuary in Memphis. “It’s definitely more rewarding because of the fact that we already knew each other…we were able to jump right in and get to work,” Taylor said of running a business with her longtime friend. While compassion for the deceased and their grieving families is at the core of their mission, Lyles and Taylor are also forward thinking about their impact in the community. Actively seeking ways to pass on their knowledge, the coworkers have partnered with their alma mater, Northwest Mississippi Community College, to allow students to gain hands-on experience at After Life to help prepare them for a career as a mortician. They also have plans to host a summer camp that offers classes about funeral services to 13-18-year-olds interested in the mortuary industry, as well as provide courses for adults regarding life insurance and the funeral arrangement process. “We are here for families and we definitely care and want them to be prepared, because we never know when they might need our services,” Taylor said. Through their efforts, Lyles and Taylor also hope to pave the way for others who aspire to work in the mortuary business.